The Wheelchair Sports Federation Sled Rangers is proud to announce our partnership with Stay-Focused, an organization dedicated to teaching physically disabled teenagers to scuba dive. Stay-Focused works to develop all of the same qualities as the Sled Rangers, such as leadership, independence, self-confidence, and self-esteem. We already have had several of our athletes experience the freedom of breathing underwater, and plan on many more joining Roger and Ryan in the future. "Stay-Focused really helped me learn things I couldn't do before, mainly scuba diving. However, this has taught me I can do more than I originally thought I could do. I love being under water and seeing all the fish swim around, doing what they do best, being fish. I can't wait to go diving again." -- Sam G.
The vision for Stay-Focused is to create a unique leadership organization for teens with disabilities that enhances their quality of life and provides the opportunity for continued growth. SCUBA diving offers teens with disabilities an unparalleled opportunity to experience freedom from their disability, gain confidence, and realize their ability to set higher goals. Friendships formed during the program last a lifetime, and Stay-Focused alumni will always be involved in guiding, and eventually running the organization. Learning more about the beneficial aspects of SCUBA diving for persons with disabilities and assisting in developing appropriate guidelines is a priority. "Stay-Focused was an extraordinary experience for our daughter Emma. The trip to Cayman built her confidence and independence to a whole new level. Water is the true equalizer, and allows her to be on the same level so she can compete with everyone else. Through Stay-Focused, Emma has challenged herself and built life skills that will help her be a leader throughout her life." -- Suzanne and Brian A. "My nerves quickly disappeared once I arrived in the beautiful Cayman Islands. I challenged myself, learned new skills and formed friendships I hope will last forever. Roger and Ryan showed me I can do anything I set my mind to. I hope many more children get to have this opportunity, and I look forward to hearing all about their adventures." -- Emma A.
Stay-Focused is a registered 501(c)(3) public charity, incorporated in 2003. Over the last 12 years, Stay-Focused has certified in SCUBA diving 82 teens and young adults with disabilities. All Stay-Focused programs are run in Grand Cayman, Cayman Islands. 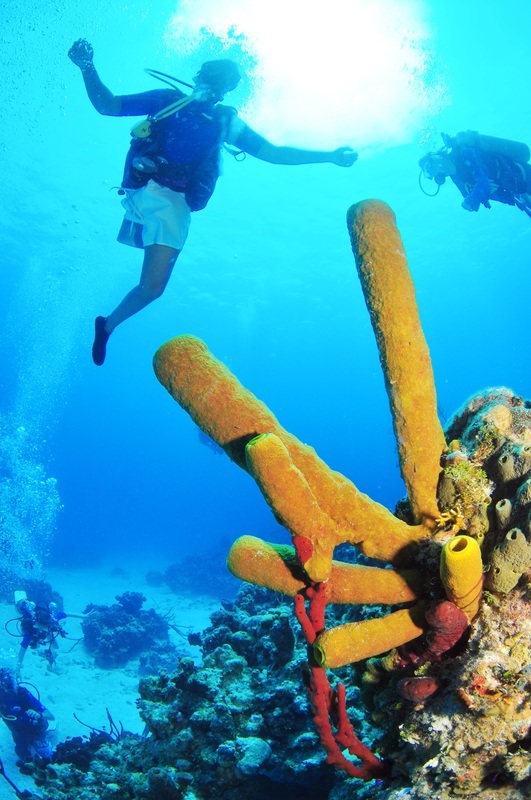 The Cayman Islands offer the ideal diving environment: consistently warm water with excellent visibility, little current, and dive sites close to shore. The Grand Cayman Marriott is our host hotel, and Red Sail Sports is our diving operations partner. "My trips to the Cayman Islands were the best days of my life." - Kenny R.
Providing a safe learning environment is both a priority and a value. Special attention is paid to ensure each participant is physically and mentally prepared to benefit from the experience. Each group of divers develops a Responsibility Code at the start of the program that guides their behavior and underscores the value of teamwork. Respect for the individual is paramount, and each program supports the tenet of “no one left behind”. Integrity is understood, persistence encouraged, and leadership developed.